Located between the beautiful areas surrounding the Birkirkara Church and Mdina in Malta, this bright, large, fifth-floor penthouse is designed to feel entirely open and connected. It has no dividing walls and instead has been designed with delineating features and lighting which separate different functional zones by means of their own respective energy. Inspired by Neo-Futurism, the penthouse has a warm 1970s space bunker feeling to it, whilst remaining warm, textural and inviting. We created this sensation by including curvaceous, industrial and raw surfaces and forms in the design. Yet despite this utilitarian aesthetic, the design is clean and slick throughout. There are two main design features to the penthouse: the free-flowing kitchen island and the curved bulkhead with its integrated floating fireplace. There is a fluid dialogue between their composition within the apartment – each piece naturally leading your eye to the other, and back and forth in a fluid circular motion. 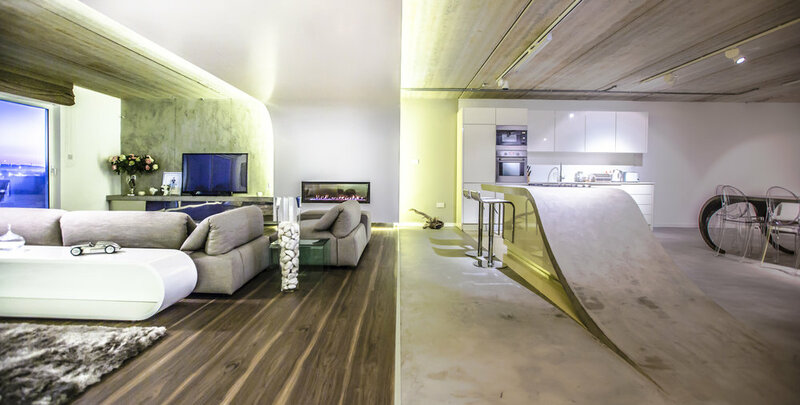 The island seamlessly morphs out of the concrete floor, peeling and exposing a white resin flooring underneath almost as if the space is shape-shifting beneath your feet to cater to your every need. We left the original pre-stressed concrete roof planks exposed to form our ceiling, which has hints of warm rust spotting through and creating an earthy and rich texture. The living room floor is split in line with the end of the curved bulkhead, changing from micro-concrete flooring to timber walnut, carpeted with luxurious, cream rugs.The general lighting uses white surface mounted track lights with industrial galvanised conduits. Bespoke glossy white rounded console tables, and an original Mizzi Awkward dining table complement the free flowing fixed interiors. The result is an uplifting, unconventional and playful space.